How do you translate ten years of gene research into a product package? A. Quickly and efficiently. While the science labs worked for a decade to achieve breakthrough formulas, the in-house team was tasked with bringing the company's premium skincare product to market in under a year. In addition to the abbreviated timeline, the design and development parameters were tight. 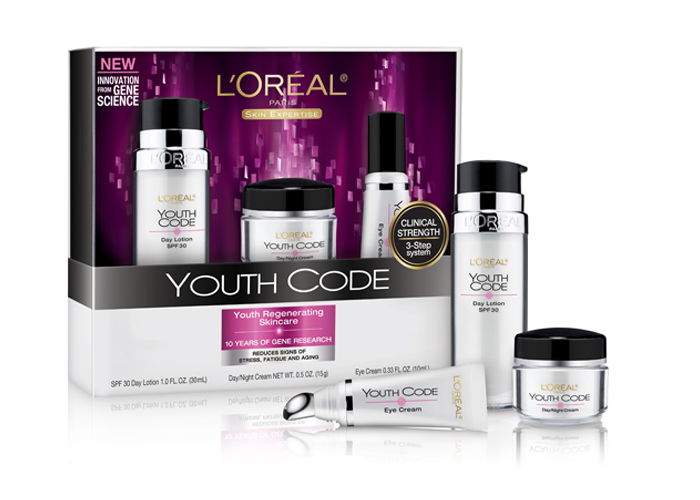 As the Senior Art Director, I created this new product franchise within an established design language (see Skin Genesis redesign) and a crowded anti-aging portfolio. Economics also necessitated re-imagining components from the company's existing assets. 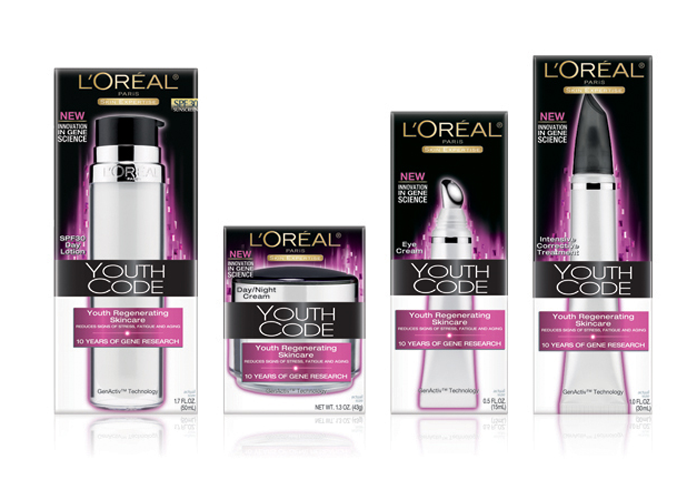 The starting point for the Youth Code global product launch was L'Oréal's core positioning of integrated science and beauty. A bold color palette inspired by cosmetics packaging, as well as attention to the smallest details helped achieve this delicate balance. Naturally, mood boards were created from images of genetic coding that ultimately enveloped the components. 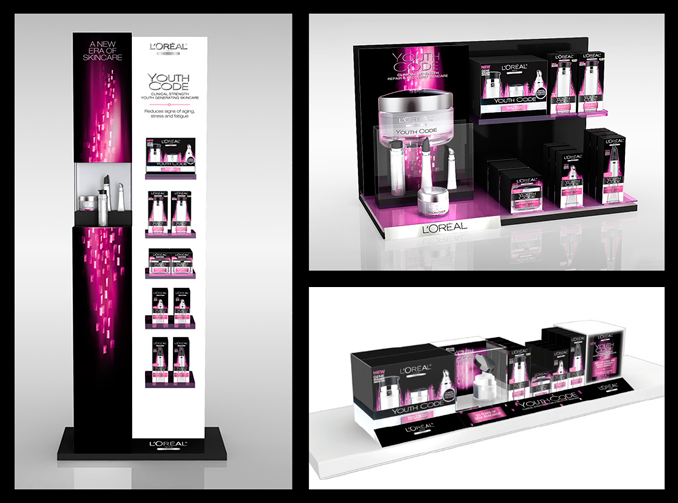 Creative oversight included concept development, primary and secondary packaging, line extensions, retail displays and marketing collateral. 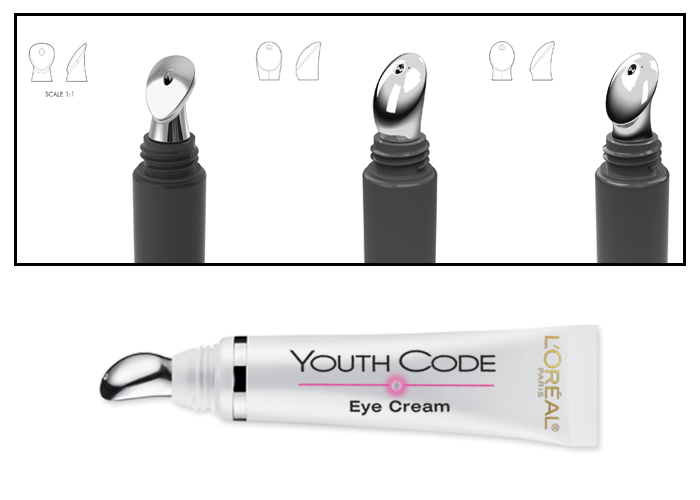 It's gratifying in the end that I was named patent designer for the custom-designed applicator tip on the eye component and the product garnered a 2011 HBA International Package Design Award for Skincare.